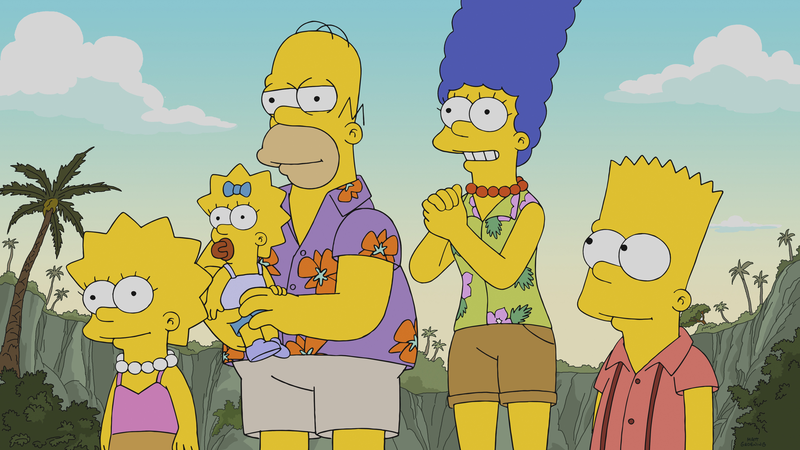 Review: ‘The Simpsons’ 29th annual “Treehouse of Horror” is an enjoyable mix of humor, horror and parodies! “Possible side effects include: back spikes, protective plates, giant claws, fear of asteroids, being a precursor to our modern birds, a second tail brain, loss of ears and increased libido. If you are currently egg-laying or expect to be egg-laying, consult your paleontologist. The Simpsons annual “Treehouse of Horror” installment keeps striking a great combination of humor, horror and pop references. 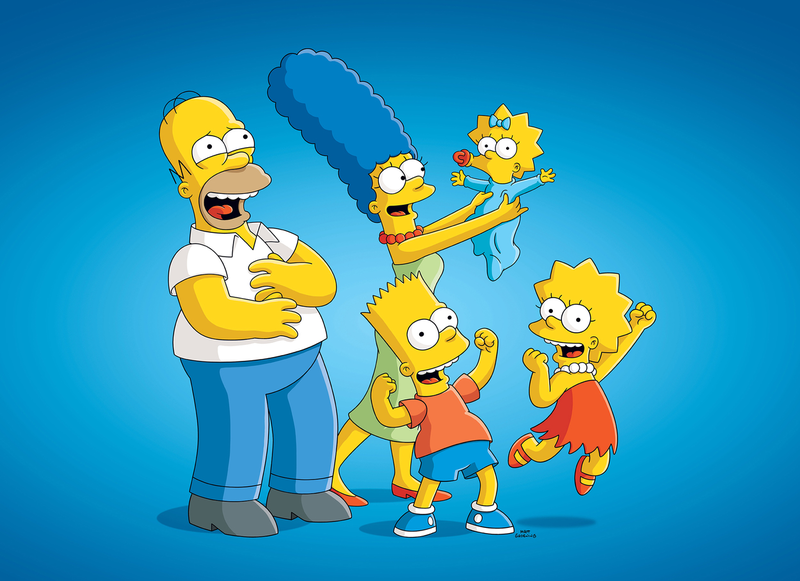 This year’s episode, “Treehouse of Horror XXIX“, manages to maintain the high quality of THOH episodes, while offering new stories and parodies. The episode starts with the Simpson family visiting Fogburyport, a dark and weird town, were Homer competes in an oyster-eating contest against mythical creature Cthulhu. Homer eventually wins the contest, as apparently hadn’t eaten breakfast. The monster faints and the family cooks and eats it. When Homer pricks the monster’s body, some sort of purple blood/ink writes the title card of the episode. The first segment, “Intrusion of the Pod-Y Switchers” (a parody of Invasion of the Body Snatchers) sees the citizens of Springfield being attacked by plant-shaped aliens, who use the newest MyPhones (from Mapple) to distract the citizens and attack them with their spores that kill and then replace them as ‘zombified’ versions of the humans. Bart and Lisa try to escape from the plants, but they are eventually taken, only to realize the plants actually transfer their consciences to an utopic reality, where they get distracted by their phones as well. The second segment, “MultipLisa-ty”, sees Bart, Nelson and Milhouse trapped and chained in a place after they had a sleepover at Milhouse’s. The person who has emprisoned them turns out to be Lisa, who acts in a very unusal way. Lisa is in some ‘crazy mode’ while also mad with the boys. The silly versions of Lisa are hilarious and fascinating, as Lisa isn’t usually seen with those personalities. 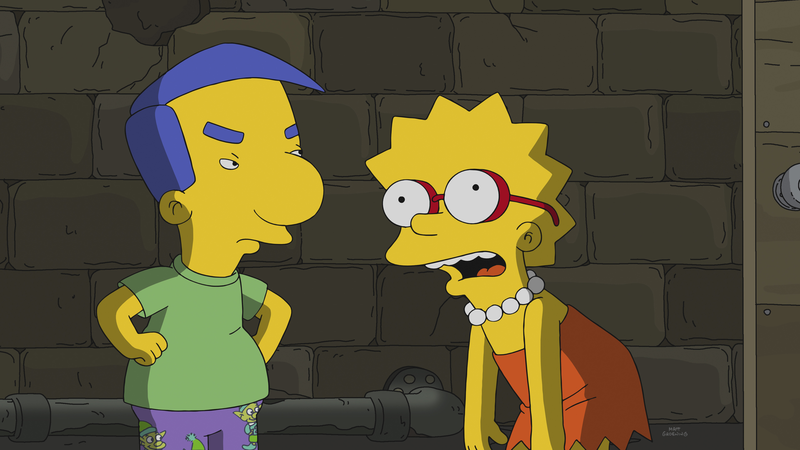 Yeardley Smith‘s voice-acting as Lisa is always outstanding, but the talent she proves in this segment is masterful. Her performance of the Scottish Lisa is a must-see. At the end, Bart understands the reason why Lisa snapped. He succeeds in making an emotive fraternal speech that makes Lisa turn back to normal again, and save his life. The segment itself seemed a bit all over the place, but that also appeared to be the idea. The third segment, “Geriatric Park” (a parody of classic Jurassic Park), revolves around Mr. Burns‘ new retirement home/park, in which the DNA of the senior citizens is combined with dinosaur DNA to somehow rejuvenile them, and in turn “giving them a better life”. When the Simpsons visit the park, Grampa claims they are always keeping the temperature cold there, so Homer (ignoring a warning post), increases the temperature with the thermostat. The temperature increase causes the old people to turn into dinosaurs, who go furious and start causing chaos. Eventually, Lisa appeals to the good heart of the senior people, calming them, just saying they only want more attention. 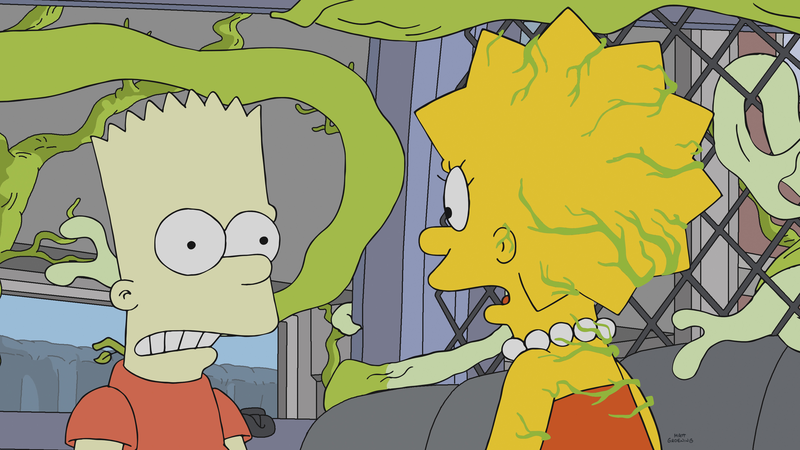 The episode, written by Joel H. Cohen and directed by Matthew Faughnan, is another great installment of one of the show’s most valuable traditions, the Treehouse of Horror episodes. There’s just some points the show could have delivered better. THOH segments have recently become more focused in pop culture parodies than in parodying horror stories or telling original stories. There’s nothing bad in that, but since the episodes are titled Treehouse of Horror, it’s expected to see horror stories comically parodied. This year’s show manages to do that quite well. This show has started its unprecedented 30th season with well-crafted and enjoyable episodes. This year’s THOH has been exciting, surprising and humurous. It’s a funny, must-see episode that will sure get laughs. Stay tuned for more reviews!! *When Lisa is taken by the plants, she has some hallucinations, including a brief appearance of Luci, from the new Matt Groening show Disenchantment. In another hallucination, Lisa sees Homer and Bart dancing “you don’t win friends with salad”, from Season 7‘s “Lisa the Vegetarian“. When the spores are released, the Planet Express ship from Futurama can be seen carrying a flag that says “Bring Back Futurama“. Then the spaceship from The Orville show appears and attacks the Futurama ship. Again, Lisa with Groundskeeper Willie‘s scottish accent is dazzling and highly hilarious. Next year’s THOH (the 30th installment) has been confirmed to be the 666th episode of the show. There couldn’t be a better number for a THOH episode. In the third segment, the family flies over the doors of Jurassic Park, Jurassic Park 2, Jurassic Park 3, Jurassic World and Jurassic World 2 while traveling to the Geriatric Park by helicopter. In the second segment, the reason for Lisa snapping is that Bart changed her answers in an exam and made her fail. (Miss Hoover noticed someone had overwritten Lisa’s answers, but preferred to enjoy the feeling of making her fail). Although Kang and Kodos seem to not appear during the episode, they actually appear briefly as background characters in the utopic reality. You do know of the word “where,” right? And the show starts the 30th season on December 2.